Color lines were broken on April 15, 1947, almost a generation before the Civil Rights Act. That still left a lot of barriers to break down, even after Jackie Robinson took his first step into fair territory on a major league diamond. Surely, you didn’t see a lot of Asian Americans on baseball teams back then. Still don’t. And since it falls on a Friday this year, we should make it an all-Jackie Weekend just to take in all the significance. Robinson’s first days are worth remembering. Just like the days when you were the only Asian, only Filipino, or only minority in the room in your respective field. Robinson started at First Base and batted second when Brooklyn played the Boston Braves in Ebbets Field and won that first game 5-2. He didn’t get a hit, but reached base on an error and scored his first run, which broke the tie that enabled the Brooklyn victory. It was one first after another. Robinson’s first hit, a single, didn’t come until his second game, April 17. On April 18, Robinson got his first RBI and his first home run. The Dodgers still lost the game, 10-4. But that’s OK. It was against my beloved Giants in the Polo Grounds. Somehow, by design, the Giants and the Dodgers, now both in California, always play on Jackie Robinson Day. This year, they’re in Los Angeles, where the big matchup is the pitching duel between the Giants’ Madison Bumgarner and the Dodgers’ Clayton Kershaw. For me, as an Asian American of Filipino descent, I’ll never forget covering Jackie Robinson Day 2014 when the Giants played the Dodgers in San Francisco. Of course, they all wore Robinson’s No. 42 that day. But the Giants starting pitcher Tim Lincecum was special. And not just for the mustache he sported that year. His mother, Filipino, his father of French descent gave him the genetics for his unorthodox delivery that featured his unique ball dangle. You can’t argue with the results. Can you name a more accomplished player with an Asian American background? And not an Asian import like an Ichiro Suzuki. I mean a 100 percent American of Asian American descent. 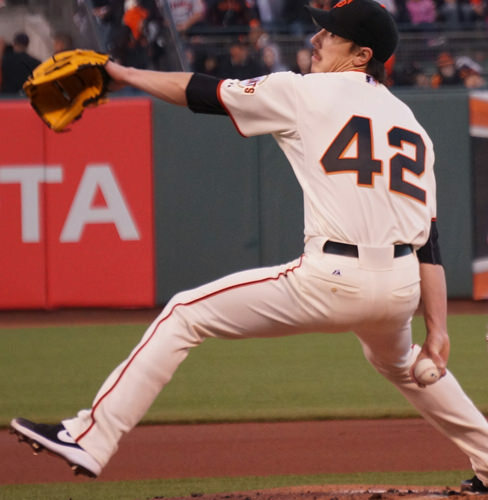 2014 was the year Lincecum pitched his second no-hitter, becoming the first in Major League History to no-hit the same team (San Diego) in consecutive seasons. Baseball is legendary for scraping through the record books for any anomaly that tells us: We’ve never seen this before. Or if we have, it’s so rare that it’s remarkable. For example, Lincecum has won multiple World Series championships, multiple Cy Young Awards (for best pitcher), multiple no-hitters, and multiple All-Star games. The only pitcher to match all that? Hall of Famer Sandy Koufax, again of the Dodgers. The Giants won that 2014 Jackie Robinson game, 3-2. Lincecum struck out 5 batters after 5 innings and left the game before the Giants came from behind. But now two years later, it’s strange not seeing Lincecum, the face of the Giants for so many years in a San Francisco uniform. Lincecum is a free agent, recuperating from surgery and hoping for a comeback. Last week, it was reported he was rehabbing and pitching without pain in Arizona. When I’ve talked to Lincecum, he was always a tad reticent about his Filipino-ness, having been closer to his father than his mother. On a short interview with him years ago, he’s pretty candid. But he was close to his maternal grandparents, and when we’ve had conversations about Filipino food and such, he’d light up and smile. He was also not burdened so much with color, to the point that it may have derailed him as it did African American ball players prior to Robinson. Lincecum always had a chance to prove it on the field. And I hope he gets another chance again, as a starter, maybe for the Giants. But please, not the Dodgers. In the meantime, Lincecum deserves mention as probably the most accomplished ball player of Asian American descent in the history of the game. Before him, the first Filipino player was Bobby Balcena, a Filipino American from California, who got a chance with a September call up in 1956. And then there were durable players from Hawaii like Ron Darling, Benny Agbayani, and Shane Victorino. But no Asian American comes close to the accomplishments of Lincecum. Who knows if he would have gotten a chance if baseball had remained racially and ethnically resistant. I know, I make a big deal about Lincecum’s Filipino-ness more than others. Maybe even more than Lincecum. But I know how people like to erase the memory of race and pretend it’s not important. In the new Ken Burns documentary on Robinson, there were more than just a few things that surprised me. For example, I didn’t know Robinson was a Republican who campaigned and worked for Nelson Rockefeller. I didn’t know Robinson was pro-Nixon, but ultimately shifted to Kennedy. Robinson was fluid politically, backing those who advanced racial progress. But he faced some backlash. There were even some who called him an “Uncle Tom.” Talk about heresy. Twenty years after the color line was broken, Robinson had to tread new cultural gaps exposed along generational, social, and economic lines. The documentary presents a strong and complex portrait of the man who traversed them all. The documentary also revealed how Robinson’s Hall of Fame plaque in 1962 didn’t mention being the first anything or breaking any color barrier. Nor was there much news coverage of this civil rights milestone. It was the year the Giants won the pennant in San Francisco. I was just in elementary school and didn’t exactly know how race played into my life. Or what a big deal it was. As Asian Americans, we’ve seen a lot of barriers. 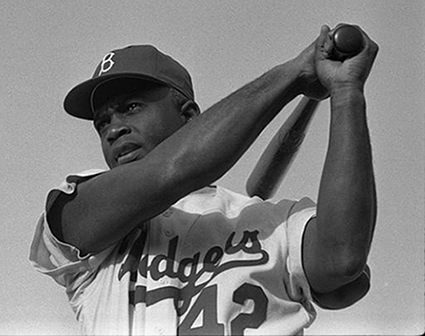 By breaking through a major institutional one, Jackie Robinson showed us how to break through them all.